I walked out the door and I felt evangelized. There was something in the air. Even though it was thirty-something degrees outside and I’m a wimp from Texas, I was feeling refreshed. I listened for the third time as Cardinal Donald Wuerl spoke last night on the New Evangelization, thinking myself a peppered veteran. I did, after all, know about some of his airplane jokes. I did, after all, have a picture with the guy. I did, after all, attend the Red Mass Brunch sponsored by the John Carroll Society which he spoke at. 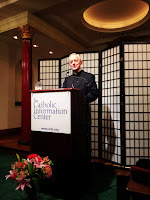 So there I was, in the second row in a small chapel fitting about 90 in the Catholic Information Center, listening to His Eminence explain his recent synod trip to Rome to discuss the New Evangelization and what exactly that meant for us, for the Church. As smug as I might have felt, I could not be cocky. 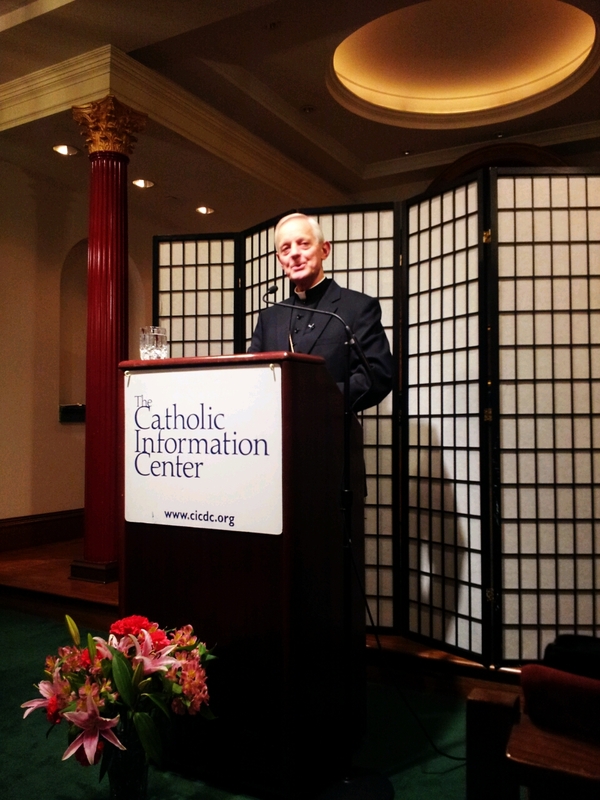 Cardinal Wuerl was speaking on some major issues regarding the future path of the Catholic Church. Before I continue, let’s backtrack a bit and tackle the word synod. For those of you who don’t know what a synod is (hey, I didn’t until recently), it refers to a gathering of bishops from around the world every several years to discuss a specific theme. They figured reconvening thousands like at the Second Vatican Council every year might be a bit excessive. The synod is the way around that. This year’s theme was the New Evangelization, which basically means we are the generation that gets to parallel the early church in spreading God’s message. Much of the environment is the same, only this time, people aren’t being told the truth the first time over. They’re being reminded, retold. And this time, we’ve got some pesky competition from the ism family: secularism, materialism and individualism. Cardinal Wuerl seemed optimistic though. When asked how he would describe the almost month-long meeting, he used the adjectives “positive, united and pastoral.” He also said it was practical. What the talk focused on, he explained, was getting back to the basics. The timeless story: God so loved the world that He sent the Word made flesh in Jesus Christ, who died, rose from the dead and ascended into heaven. God then sent the spirit that is still with us today. For a quick refresher, please visit the Creed. The three tips for the New Evangelization? Who’s involved? Everyone. Though our religious leaders need to be working hard on their part to spread God’s message of love and mercy, it’s up to us to do ours. We have to get over blaming the institution, snoozing through the sacraments, not having answers to questions, being shy or simply not caring. We need to start doing something about our faith. “It’s our moment. It’s our moment now,” Cardinal Wuerl said in his conclusion.